“I’m so happy… the sun is shining!” Stettler barrel racer, Melissa Thiessen spoke for many of us this past weekend. It was a unique and amazing experience to enjoy some spring sunshine… at least for a day or two. And it made for an enjoyable weekend of rodeo… particularly for those barrel racers who made money at one of the events scattered across the prairies. Barrel racers had high praise for the Marwayne, AB committee who had excellent ground at the 56th Annual Lea Park Pro Rodeo. I caught up with Kareen Warren by phone Friday night as she was heading home to North Battleford to start spraying crops at the family farm the next morning. Kareen enjoyed two placings this past weekend (third at Lea Park and sixth at Brooks). Ramona Nash (Drayton Valley, AB) took top spot at the northeastern/Lea Park venue with a 16.13 second run while Texas cowgirl Benette Barrington won second. The Brooks Pro Rodeo saw a new physical site for the rodeo this year… which also meant new ground. Four barrel racers shared top spot with 18.26 second runs: Judy Hyde (Prince George, BC), Suzanne Depaoli (Longview, AB), Benette Barrington and Danna Whitford (Montana). Laci Suitor (Duchess, AB) picked up fifth spot. 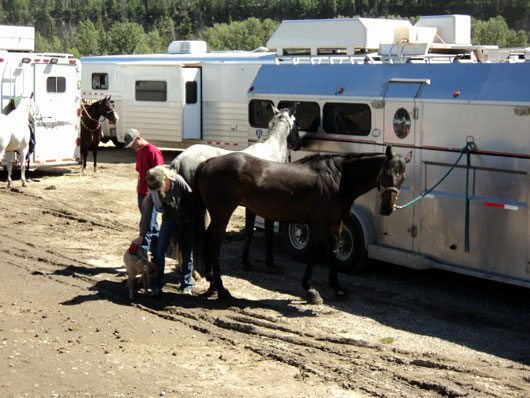 Rocky Mountain House Rodeo enjoyed drier conditions as the weekend progressed. Here as well, the committee worked long and hard to prepare not only the rodeo infield, but also the track for the pony chuckwagon racers. In the barrel racing, Haley Keenan took top honours with a 16.92 second run. Kalynn Maddox was right behind (16.92) with Britany Fleck in third spot. 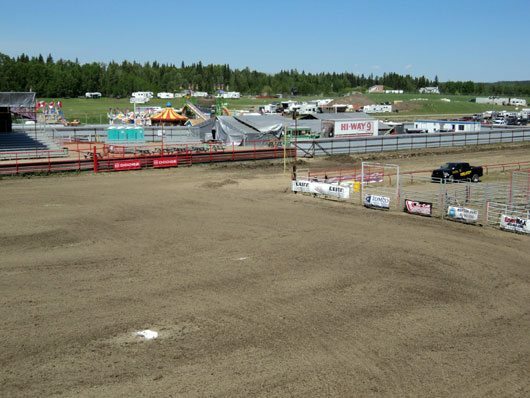 With one of Canada’s biggest pro rodeos upcoming, the 50th Annual Daines Ranch Rodeo June 16-20 in Innisfail, Alberta (125 plus barrel racers entered includng card and permit holders), the season is heating up. More U.S. competitors head north this time of year, in an effort to win enough money to start on a bid for a Canadian Finals berth. Sunshine–a lovely concept! I was really happy for the Rocky Mountain House committee who have battled–and overcome–a grandstand fire (they rebuilt it in 60 days), as well as knee deep mud and icy cold temperatures for the last few years (snow lazy year-ouch). Great to see people enjoying the sunshine and, as the weekend went on, pretty decent arena conditions.